Based on a 2008 graphic novel, 2017’s I Kill Giants introduces us to Barbara Thorson (Madison Wolfe). An adolescent girl, Barbara lives under the care of her older sister Karen (Imogen Poots) and retreats into an active fantasy life to avoid stresses related to her existence. In this “alternate reality”, Barbara defends her town from the threat of giants. A new classmate named Sophia (Sydney Wade) attempts to befriend her while a school psychologist (Zoe Saldana) works to help Barbara cope with her personal issues. On the cover of Giants, we learn that the film comes “from the producers of Harry Potter”. While this may be true, it misleads viewers into a perception of the film that doesn’t become accurate. That’s because there are no actual giants in Giants. I feel slightly reluctant to state this, as it smells a little like spoiler territory, but the film makes it clear so early that I don’t think it acts as an important plot point. This makes the promotion of Giants feel like a cheat, as it implies a world with “real monsters”, not one in which the threats exist as a girl’s attempts to cope. It’s not a terrible misrepresentation, but it does create a disconnect. The same relates to the film’s story, as it presents a narrative that seems out of touch with the real world. Despite massive behavioral issues and an obvious detachment from reality, no one seems all that concerned about Barbara, and that doesn’t make sense. I’ve worked in schools for almost half my life, and I know that a kid who acts like Barbara would receive much more attention than occurs here. Granted, some revelations we learn allow for us to accept that adults would treat her with kid gloves, but her actions go to such an extreme that it becomes impossible to accept that she’d skate through school with so little intervention. This becomes especially in a world where everyone fears the next school shooting. A kid as angry, antagonistic and delusional as Barbara would get much more intensive treatment than the occasional gentle talk with the school psychologist. Admittedly, this isn’t the movie’s main purpose, but the lack of believability harms it, and other stretches of logic become a concern as well. For instance, why does Sophia attach to Barbara so readily? As noted, Barbara presents an unpleasant exterior, and we get no real explanation why she appeals to Sophia. Sure, we know that Sophia’s the new kid in town, but the film doesn’t give us some mitigating factor to explain why she wouldn’t befriend some of the less crazy kids in class. Giants also suffers from a bad case of the Inevitables. It hints at important plot developments in a way that lacks much subtlety and sets up major revelations down the pike, revelations that fail to provide much impact because we smell them from a mile away. Even with these drawbacks, Giants manages to become a moderately intriguing project, largely due to good acting. In particular, Wolfe does a nice job with Barbara’s complexities, as she doesn’t attempt to soften her character’s rough edges. She’s willing to let the viewer dislike her, but without attempts to seem artificially abrasive. Despite solid acting and good intentions, though, Giants doesn’t coalesce into a coherent, compelling tale. 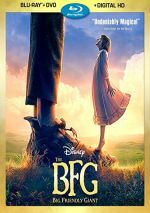 It lacks grounding and suffers from a mix of concerns, including an unrealistic character transformation that arrives at the end. While not a bad film, Giants disappoints. I Kill Giants appears in an aspect ratio of approximately 2.40:1 on this Blu-ray Disc. This became a fine image. Sharpness looked appropriate. Delineation remained satisfying, so the image seemed accurate and concise, though a few interiors showed a little softness. No issues with jaggies or shimmering occurred. I also saw no edge haloes or source flaws. In terms of colors, the movie opted for orange and – especially - teal, though it kept these subdued, so they didn’t go crazy. The low-key palette seemed satisfactory. Blacks were pretty dark and tight, and low-light shots displayed good clarity. Across the board, the visuals appeared positive. Despite the film’s fantasy orientation, Giants went with a somewhat low-key DTS-HD MA 5.1 soundtrack. Music showed good stereo presence and effects opened up matters to a reasonable degree, but not as much as expected. This meant that even when the mix opted for information related to giants, the track stayed focused on the front. The elements broadened moderately well but they added less involvement than anticipated. Still, the soundscape wasn’t bad, as it brought out acceptable spread and movement when necessary. The movie’s dramatic bent meant fewer scenes of that sort than one might assume, and they didn’t dazzle, but the mix worked reasonably well. Audio quality appeared fine, as music was full and rich. Speech came across as distinctive and concise. Effects added a bit of punch when necessary, with accurate information that brought out nice low-end at times. Nothing here excelled but the soundtrack fit the material. 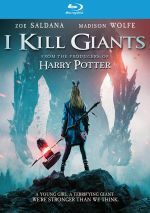 A smattering of extras arrives here, and we find a featurette called The Making of I Kill Giants. It runs five minutes, 39 seconds and includes comments from director Anders Walter, writer Joe Kelly, graphic novel artist Ken Niimura, and actors Madison Wolfe, Zoe Saldana, Imogen Poots, Rory Jackson and Sydney Wade. “Making” looks at the source and its adaptation, story/characters, cast and performances, and Walter’s impact on the production. This largely acts as promotion, so don’t expect much from it – other than spoilers, so don’t watch it before you see the movie. Anatomy of a Scene goes for four minutes, 52 seconds and features remarks from Wolfe, producer Kyle Franke, director of photography Rasmus Heise, stunt coordinator Brendan Condren, and visual effects supervisor Christophe Ferrier. We get notes about aspects of the movie’s climactic action scene in this short but moderately informative piece. For a look at the source, we get chapter 1 of the graphic novel. It’s just a tease, of course, but it’s an effective one, as it gives us a taste of how the novel contrasts with the film – “original Barbara” is only 10, for example. A Photo Gallery offers 18 images from the movie. It’s a forgettable compilation. The disc opens with ads for Odd Thomas, The Cobbler and The Adventurer: The Curse of the Midas Box. No trailer for Giants appears here. If one divorces I Kill Giants from its promotion as a fantasy film, it works better – but not to a tremendous degree. While the film boasts very good acting, it falters in too many others ways to satisfy. The Blu-ray offers strong visuals with reasonably engaging audio but it lacks notable supplements. Giants shows promise but it doesn’t hold together.